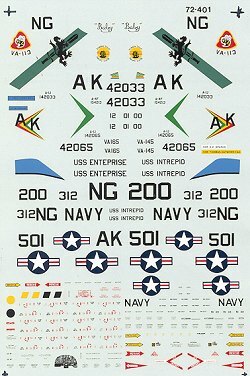 Here is another of those great air wing decal sheets. This time it covers attack squadrons aboard the Intrepid and Enterprise. All planes are light gull grey over white. Insignia and stencils are included in this one, which is quite nice. For the Skyhawk I'd recommend the Fujimi kit while Hasegawa or Fujimi would do well for the Skyraider. First up is an A-1J from VA-145 aboard the USS Intrepid. The fin tip for this one is green. Next is a VA-113 A-4F from the USS Enterprise. There is another set of ship name decals in the packet as they misspelled it on the main sheet! 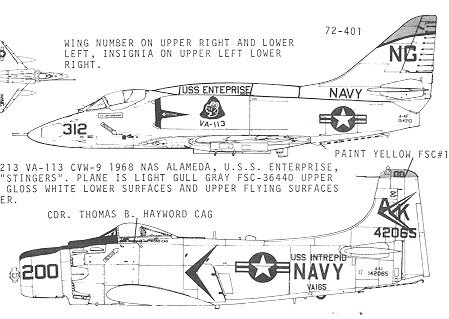 I should mention that the drawing shows an A-4L so is not correct. Finally, the CAG bird from VA-165 aboard the USS Intrepid. The fin tip in this case is yellow. Review copy courtesy of my ever growing decal pile!